Selena Gomez got a sweet birthday gift (gifts, actually) from boyfriend Justin Bieber on her 20th birthday last Sunday, July 22, 2012. HollywoodLife.com has reported that Justin Bieber treated Selena Gomez with a romantic and intimate birthday party at a posh restaurant in Beverly Hills, California. According to the report, everything in the party was Bieber's idea (the menu, decorations etc.) and he even prepared a sweet speech for Selena which put her to tears. On Monday, July 23, a day after her birthday, Selena Gomez tweeted this photo of a cake decorated with rose petals (are they real?) along with the caption: "beyond blessed, so much love. Thank you for the most incredible birthday yet! I'm truly, truly grateful. I love my family, friends and all of you." 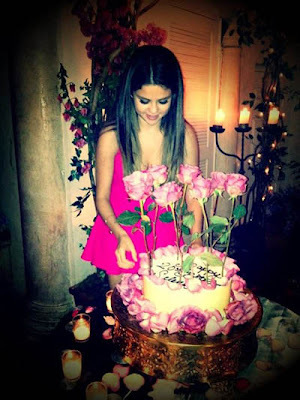 Though Selena didn't tell who gave her the rose cake, but I'm sure it came from her boyfriend Justin Bieber. And Bieber's sweetness doesn't stop there. Bieber reportedly has also given Selena a key to his L.A. mansion as birthday gift. The said mansion was the one Bieber bought for himself during his 18th birthday last March. Oh sweet! And that makes Justin Bieber one of the sweetest boyfriends in the world.